Tiny Doom here. I am going to be sharing my thoughts on an indie comic from some local creators. For an extra spin on this review, honorary Lady, The Goog, will be joining me so that in the spirit of wrestling, we can co-author this post as a husband and wife tag team. My thoughts will be in green, and The Goog’s in blue. 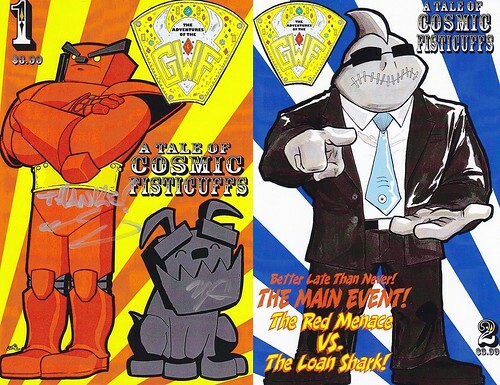 The first storyline for the GWF is called “The Road to Redemption” and issues 1 and 2 are currently available. The story follows our protagonist, The Red Menace (loosely related to our Red Menace), a robot wrestler, on his journey to both find himself and avenge his father. TD- When I first picked up this book I was a little concerned it wouldn't appeal to me because I don’t really have a background with wrestling (actually, The Goog and I do occasionally attend a WWE pay-per-view party but we are mostly there for the food). However, a great surprise about this book is, you don’t need one! All you really need to bring to this book is a love of illustrated story-telling. The exposition on how the wrestling federation works is laid out for you at the start in a way that feels natural and is also quite fun. In fact, the thing I liked best about this book was the humor. The story premise of a hero's journey (yeah, I know my Joseph Campbell) is one that could go total emo angst very quickly. But nope, Howard and Wolman use humor and snark to develop characters and make the story so much fun that I was honestly annoyed when I got to the end of the first issue. I wanted more! Issue 2 gives us a deeper look at our hero, the fantastical world of intergalactic wrestling, and of course more cosmic fisticuffs. It's worth noting that although this comic deals with wrestling, the fighting is done in a cartoony way, making this a great all ages comic. Earl Yi’s art is super rich and at times, quite cute. Take your time with this one, especially on crowd or space pages and be sure to let your eyes roam over the pages. There are lots of visual gags and fun images. TG- I'm not a wrestling fan so I bought the first issue mainly to support my friend. I expected to enjoy reading the book, but I wasn't expecting to enjoy it as much as I did. It's paced really well (writing and art), so it runs very smoothly from scene to scene, the story and action are easy to follow and it's obvious that the creators spent some time developing the universe in which all the characters live. It's kooky and a bit bizarre (just how I like it) and a lot of fun. They tease out just enough about each character to make you interested in them all and luckily, they provided a bunch of profile pages in the back of the book, along with some fun in a word search, a connect the dots, and a maze. That's a lot of entertainment for $3.99! My one complaint would be that some of the fight scenes can be a bit distracting, Mr. Yi packs a lot of drawing on each page, especially during the fights, and the crowd is as much a character as the main event (look for some clever and surprising cameos). There are some pages where I'm not sure where I should be looking right away, but it honestly doesn't take much to figure out what's happening, so it's a minor gripe and really the only bad thing I can say. I look forward to issue three! Bonus: Space Whale! As mentioned above, take your time with the pages. 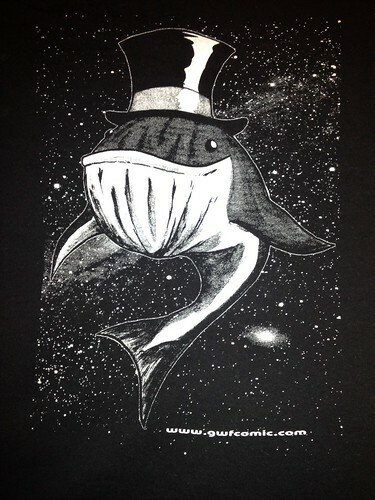 On the second page of the first book is the most amazing space whale wearing a top hat. After a few folks mentioned that they would wear a T-shirt of this wonder…well, ask and you shall receive! Double bonus: Check out a quick interview with Bob and Earl at NYCC. GWF comics, t-shirts, and stickers can be purchased at Comicazi (Davis Square, Somerville MA), or on the GWF website. Disclaimer: This comic was created by people I like very much. That said, I have volunteered to do this review and have purchased both book 1 and 2 (and will purchase issue 3).